Last week’s events in Charlottesville serve as a chilling reminder of why it is essential for us to tell, and keep telling, the story of slavery in America. 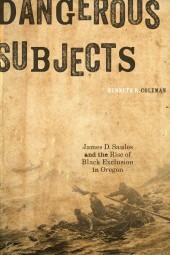 Oregon entered the union in 1859, just before the Civil War, under a cloud of deliberate racial exclusion that casts its shadow to the present day. 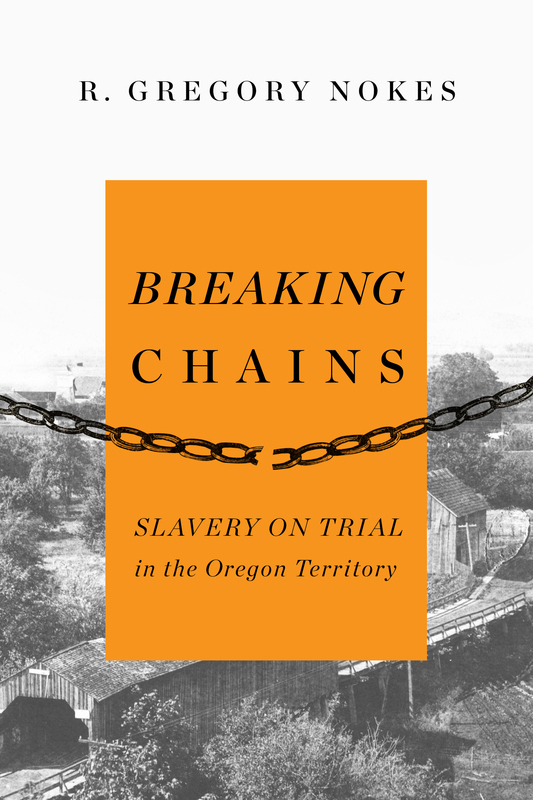 These books from OSU Press confront, each in its own way, the legacy of slavery in Oregon. What does it mean to conduct research while still being respectful to the population being studied? For Renee Pualani Louis, this was a question she faced when studying Hawai‘i cartography for her new book, Kanaka Hawai‘i Cartography: Hula, Navigation, and Oratory. Louis had signed up for classes at Aunty Margaret Machado’s Hawaiian Massage Academy, where she met Aunty Moana Kahele. She had entered the classes purely with the intent of learning lomilomi, Hawai‘i massage, but also had an interest in the place names and stories of the area surrounding them. In this excerpt from Kanaka Hawai‘i Cartography, Louis illuminates the research process she used with Aunty Moana and the relationship they built from their time together. I conducted our discussions in English, and at times, Aunty Moana would say a few phrases in Hawai‘i language, asking if I understood what she said. Most of the time I did understand her, but responded with my limited language skills and usually finished off in English. This naturally set the tone for our rapport. It did not stop her from using Hawai‘i language phrases; she just did not expect me to respond in Hawai‘i language. I am certain that a researcher with more confidence in their Hawai‘i language skills would have received a different depth of sharing to which I was not privileged. Although I initially set out to digitally record our discussions, both audio and video, Aunty Moana preferred that our sessions be conducted without being taped. Instead, she referred me to another video done by Kamehameha Schools Land Asset Division. In one instance, I was told specifically that the stories being shared were for me to remember and not for others to know on a tape. I was able to get a copy of both the report done by Kumu Pono Associates and the video done by Nā Maka O Ka ‘Aina. As Aunty Moana spoke of different places, she weaved in genealogies and personal experiences. After three or four sessions, I started asking if the person she was talking about was the same one from a different story, stating, “You know, the one where…”, finishing the sentence with the story she had told me. Occasionally, she corrected me, emphasizing points I was certain I hadn’t heard before. It was about this time that I shared with her two dreams I had about Kealakekua and Kapukapu. Although having a well-known and very deeply respected person willing to share the stories of Kapukapu could be seen as reason enough to conduct this research, I acknowledge that, for Native people, the search for knowledge is much more than a physical task. It is also a spiritual learning. I continue to hear many stories of academics doing research on Indigenous people or in Indigenous communities for research’s sake, without bothering to ask if either the people or the place could benefit from the research. I didn’t want to be one of those people, and while I knew Aunty Moana wanted to work with me and wanted to share her knowledge, I just wasn’t sure the place was ready to share itself with me. So, I did what came naturally. I prayed for a sign, a vision, a dream, anything that would let me know that it was pono, meaning proper, righteous, virtuous, to do this research and learn about the intimate details of Kapukapu. Thankfully, the answer came in the form of several dreams over several weeks. These are two of the dreams I shared with Aunty Moana. In the first I was a young girl running, playing with a young Kanaka Hawai‘i boy in a forest. I was chasing him on a worn path, both us laughing as we took turns hiding with the chance of surprising the other unawares. We decorated each other with flowers and ferns picked along the way. We climbed trees, made birdcalls, picked and ate fruit. By and by we reached a community near the shoreline. I observed many structures, men fixing fishing nets, women picking seaweed. Although the people noticed us, they returned to their work speaking to each other… in Hawai‘i language. That was certainly strange, because although I passed my language requirement by taking a third year of Hawai‘i language, I still didn’t feel confident in my ability to speak Hawai‘i language and was still only somewhat confident in my ability to comprehend oral communication. So, hearing them speaking Hawai‘i language and understanding them in my dream was strange, in retrospect. Nonetheless, no one stopped either the boy or me from playing. No one scolded us for making too much noise. No one warned us not to go over the ridge. I remember feeling like this was a new place to me. Like I was the new kid and this young boy was from this village. I felt that he must know the right places to go and not to go, because I certainly didn’t feel like I knew. We continued to play, winding our way up the mountain playing hide-and-seek in empty caves. The higher we got, the funnier the air began to taste, and all of a sudden we were at the ridge, and we were very quiet. The little boy’s eyes were in distress as he motioned for me to meet him on the summit. I slowly joined him and saw the reason for his anguish. On the other side of the ridge was the modern development Kona has become, with houses, roads, industrial warehouses, and an ocean filled with motorized fishing boats. Gone were the trees, gone were the birds, gone were the places for the practices of the people of old. Without saying a word, he communicated to me with a long hard glare, and I knew what I was supposed to do. As he returned to his village, his time, I stood and walked the summit toward the ocean, the village on one side, the modern development on the other. These two incongruent cultural landscapes were separated by this ridge that I walked like a fence until I reached the ocean. I sat on the cliff pondering what this all meant as the sun began to set. I realized I was at a juncture in space/time. I knew what was coming fro the village. I knew the cultural landscape that celebrated a Hawai‘i understanding of life would soon be engulfed and could quite possibly be forgotten… unless some people chose to remember, and not just remember but remind others of what existed here before it became thoroughly swallowed up. Becoming or being one of those people is a tall order, a hefty responsibility that I was not sure I was chosen to carry out. So I did the unthinkable. I dove off the cliff into the ocean below, even though I somehow maintained my fear of the ocean in the dream. I remember thinking that if it was the right thing to do, I wouldn’t die. I had heard somewhere that if you die in your dreams you are quite possibly dying, and I didn’t want to die. I just wanted to know for sure that this was right. I didn’t die. I remember surfacing rather relieved. I was treading water when I saw probably my greatest fear approaching, the huge dorsal fin of a shark. I began thinking now I was going to die. But then I didn’t panic or feel like fleeing. I remember thinking if this was it, there was nothing I could do. Then I realized I was surrounded by all the creatures in the ocean, turtles to the left of me, dolphins to the right, and various fish scattered between them, including rays and eels. As the shark slowed and settled in front of me, the circle was complete. The awe I felt for all these ocean creatures to surround me as such was so great, the meaning too much for me to comprehend, the power too immense to perceive. I awoke, but as I did I remember looking down seeing it all: the circle, the village, the modern development, and me. By the time I had my second dream, I had a chance to speak with someone about my fears of the ocean. I expressed the reasons and the rationale for my fear and was given very good advice from committee member Manulani Aluli Meyer in a personal email communication. She said fear lives in our minds. When it is shaped by experience, it becomes a conception that is difficult to change by just thinking about it. To remove this kind of fear, I had to get out of my mind and return to my body. I had to go into the ocean and deconstruct the fear that I had created in my body by retraining my body to change my response to the ocean. I did just that. I started taking small steps to get over my fear and began visiting the ocean more often and staying in the water longer with each visit. At first the slightest touch of any object would send a bolt of terror through my body. Eventually, I got over the terror of things touching me in the ocean and started working on feeling comfortable treading water. This is a good place to tell you about the second dream, because it starts with me treading water in the middle of Kapukapu. In this dream I have no idea how I got to be in the middle of the bay. There are no boats around me, no kayaks, and no people, just the calmly lapping sounds of the ocean all around me as I tread water looking west into the Pacific Ocean. In this dream I am not afraid of the ocean or of not being able to feel the earth under my feet. As I turn to my right, I see the flat of Ka‘awaloa and imagine the ali‘I, Hawai‘i leaders, that made their residences there. It seems like an excellent place for affairs of the government. It’s near a permanent aquacultural food supply, has access to agricultural fields up mauka, has easy, quick access to launch an attack or flee from one, and has several brackish water holes. As I continue to turn to my right, Kapaliomanuahi rises from Ka‘awaloa flats and becomes Nāpalikapuokeoua. The sight is immense, and I realize that where I’m treading water, the ocean floor is probably as deep as those cliffs are high. I continue to turn to my right, facing east looking toward the beach. I imagine the shore once lined with sand and small structures for the kāhuna, master practitioners, who lived and practiced here. Still turning to my right I see Hikiau Heiau and realize it would have been the tallest structure on the beach, but is now dwarfed by modern homes that continue to line the coast as I turn to the south. It is at that moment that I sense the presence of another. It was the shark, Kua, from Ka‘ū, an ancestor for many families from Ka‘ū and the namesake for Kealakekua, according to Aunty Moana’s story. I turn to face him. It seems as though I know that this is the reason I was there treading water. I was waiting to meet him. In retrospect I am really not surprised I was not afraid of treading water or the arrival of a shark or meeting such an important ancestral entity. I turned completely toward Kua and said, “Ah, there you are.” He swam by, nudging me, and I took it as a sign to hold on, which I did. It’s amazing that you can breathe underwater in your dreams. He gave me a tour of the bay, showing me the many crevices and underwater caves. It was beautiful. When it was time to go, he looked me in the eye. I recognized that look. It was the same glaring look the little boy gave me at the summit. They were one and the same. It was after this dream that I finally felt this research was the right thing to do. I, of course, shared these experiences with Aunty Moana, and our talks became more intense. She would still take quite a few minutes talking about the demands others were placing on her time, but she more quickly moved on to telling me personal stories and experiences she had in connection to the spiritual landscape of Kapukapu and its surrounding areas. I literally felt myself transported into the stories she told—and I didn’t even have to close my eyes to imagine them. As I sat on the floor of Aunty Moana’s living room, I had no idea there was actually a pattern being revealed. She began with the story of Kealakekua as she had heard it passed down from generation to generation. She then elaborated on the misrepresentations of seven names that have been changed and circulated in textual and cartographic sources. Lastly, she breathed life into Kealakekua, revealing nine intimate stories of sensual geographies. She would always give me a few days between sessions and encourage me to spend that time in those places I learned about. She said we remember better when all our senses are engaged in the learning process. That way the place and the story fused without na‘au, small intestines, and metaphorically, the seat of thought, intellect, affects, and moral nature (Andrews 1865). Our minds record everything, but our recall is usually limited to those things on which we focus. By experiencing the world more sensually, we allow our minds to make more subtle connections with each place. A practiced mind associates smell, temperature, humidity, wind direction, and the rhythmic movement of plants with the precursor of bad weather and will automatically bring a jacket to work without even thinking twice. I spent many, many hours learning dozens of stories from Aunty Moana that summer. Stories that became a part of my being as I sensually experienced as many places as I could access. I was sad for my summer of learning to come to an end, because I knew I had only scratched the surface of knowledge maintained by this respected community elder. After each one of our discussions I wrote down as much as I could remember in personal journals. However, I remember thinking that I didn’t want my writing things down to take away from the experience of remembering the narrative, from experiencing the performance. I reminded myself that these notations were not meant to be a substitute for the performances. They were meant to aid me in writing this manuscript. On my last day that summer with Aunty Moana, I wrote down the place names of all the stories she had shared with me and asked her which ones I could share in my dissertation. We discussed the reasons for each selection, and just before I left she handed me a handwritten copy of her manuscript, “Clouds of Memories.” She explained that she wrote all these stories down as she grew up listening to friends and family “talk story.” Since it was her last and only copy, I refused to take it and later acquired a copy from a friend to whom she had given a copy some years earlier. I continued to call and visit Aunty Moana regularly after I returned to O‘ahu. The phone calls became fewer and farther apart, mostly because she was very busy working on other community matters. However, I was beginning to write up the work we had done together and wanted to present it at different conferences and needed to share that with her before turning in an abstract. When I did get through to her, she asked me where the conference was being held, who would be attending, and why I thought it was important to share the information. I asked before each conference and each article that referenced any information she shared with me. Although these conversations were the most tedious, they were also the most liberating because I knew I had received her blessing. This may seem excessive from the perspective of an academic code of ethical conduct, but it was the right thing to do. I continue to honor Aunty Moana at any presentation that contains any information from our work, or rather my training, together. Sometime later Aunty Moana was checked in to the Kona Hospital when she could no longer care for herself. Thereafter, I visited with her at the hospital, bringing her my latest chapters or articles. By then, she had grown to trust my representation of the information she shared with me, and most of our time together was filled with retelling stories. In the last few months of her life, I discovered someone had stolen Aunty Moana’s handwritten copy of her then-unpublished manuscript. On what was to be my last visit with her, she asked me to make copies of the manuscript I had acquired from a friend so she could give them to her adopted son and daughter. I gave her my “field” copy that day, knowing I had another “clean” copy at home. I told her I would bring the other copy next time, when I got back from a conference. At that moment, I realized there would not be a next time. Henry Zenk, co-translator with Jedd Schrock of My Life, by Louis Kenoyer: Reminiscences of a Grand Ronde Reservation Childhood, is here to explain the complicated and painstaking process he and Jedd Schrock undertook when translating the reminiscences left by Louis Kenoyer. Kenoyer was the last known speaker of Tualatin Northern Kalapuya, the language in which he dictated his memoir, describing life and recounting his childhood o n the Grand Ronde Reservation in Oregon in the late 19th Century. Zenk and Schrock were confronted with what many may have found to be an overwhelming obstacle: the linguists whose manuscripts they worked from left them with an incompletely translated text, but did not provide them with a usable description of the language’s grammar. 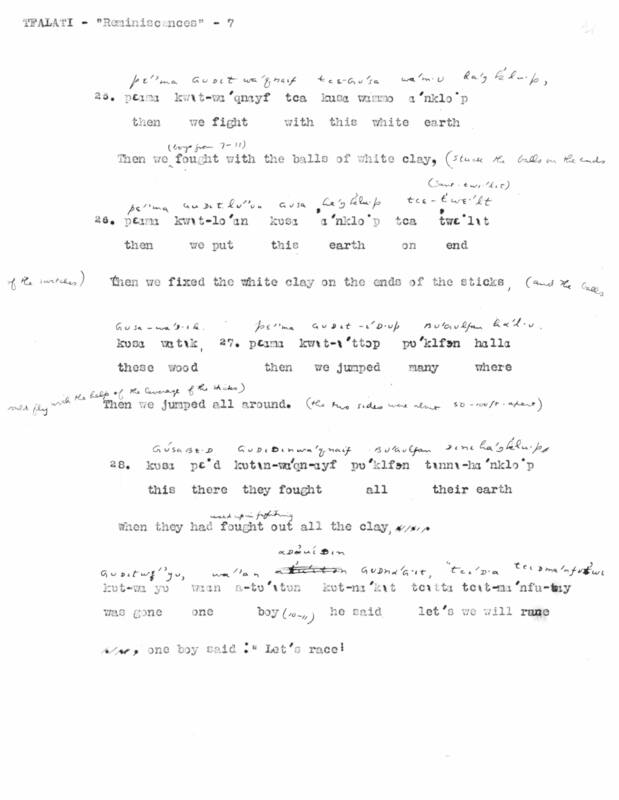 The illustrations below sample the record left by the three linguists whose manuscripts Zenk and Schrock worked from: first, a typescript-page with interlinear and free translations; next, a field-notebook page with field translation; and finally, a field-notebook page minus translation. The subject matter of My Life, by Louis Kenoyer is a long autobiographical narrative told in Tualatin Northern Kalapuya, the indigenous language of one of the founding tribes of the Grand Ronde Reservation community. The narrative was dictated to three linguists by that language’s last known speaker, Louis Kenoyer, who died in 1937. Jedd Schrock and I undertook this task without the benefit of a proper formal description of the language’s morphology and syntax. While the three linguists who worked with Kenoyer left us an abundance of texts and word lists, they apparently devoted little attention to ferreting out subtle variations of linguistic form, as visible notably in the many permutations of recurring elements constituting its verb prefixes. This seems a good time to pause and reflect on just how we managed to understand Tualatin well enough to translate it into English, lacking a formal description of the language’s grammar. The main key to our translation resides in the three linguists’ field translations, given by Kenoyer himself as the linguists read back the Tualatin text they had just transcribed from him. There are some complications, however. 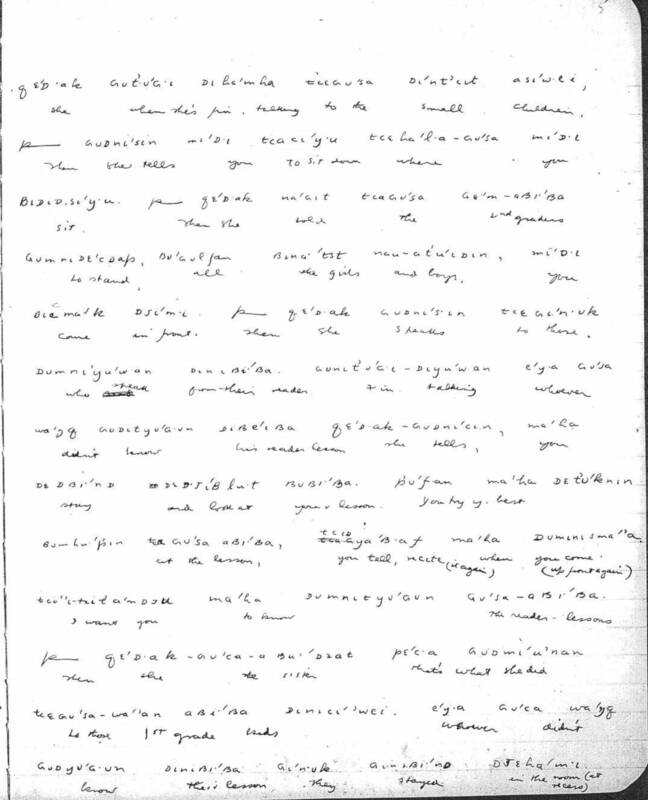 For one, the last quarter of the narrative (60 pages of bilingual English-Tualatin text as published) lacks a field translation, being preserved only as a Tualatin-only phonetic transcript in the field notebooks of Melville Jacobs, the linguist to whom we owe the final form of the narrative. For another, the field translations are rather free. To some extent, this reflects the fact that Kenoyer was quite comfortable using English, in which he was not only fluent but also literate (owing no doubt to a youth spent largely in government boarding schools, one of the main subject-matters of his narrative). In common with all Grand Ronde Indians of his generation, Kenoyer had also used Chinuk Wawa from childhood, a circumstance of some significance I believe. I was fortunate to have heard Chinuk Wawa from some of the last fluent elderly speakers of Kenoyer’s home community of Grand Ronde, among them Kenoyer’s step-niece, Clara Riggs. This experience has enabled me to recognize not only Chinuk Wawa words that Kenoyer used as part of his Tualatin (and there are quite a few of those), but also, what I take to be evidence of deeper influence affecting his Tualatin word orders. The main difficulty confronting any attempt to use Kenoyer’s field translations to decipher his morphology is that his field translations are not literal. When translating his dictations as they were read back to him, Kenoyer was clearly more concerned to produce an intelligible, colloquial English, than he was to register minute differences of morphological form. What we really need is a living, fluent speaker, with whom to explore such fine distinctions in an experimental spirit. Through a process of trial and error, we might hope to tease out the nuanced meanings lent by a speaker’s selections of particular prefixes and suffixes to express particular meanings in particular contexts. While that can be quite a long drawn-out process, it leads to the most trustworthy results. If you have any such speaker for the indigenous language you are studying, take very good care of that speaker—he or she is gold! We don’t have that for Tualatin, nor for any of the other Kalapuyan languages. working hypotheses against the untranslated text, then took them back to the translated text to see how they stacked up against Kenoyer’s field translations. This created a mutually reinforcing feedback loop, the ultimate result of which is that we must take the main credit—or blame—for the final form of the finished translation. Our independent translations of parts of the untranslated text came out looking very similar in all cases, giving us a high degree of confidence in the final product. While we must grant that an improved control of the morphology would permit a further sharpening of the translations, we feel that our translations compare favorably on that score to Kenoyer’s own field translations. Speaking for myself, I would describe the translation process as a kind of gestalt exercise. This was most true, not surprisingly, for the untranslated sections of the narrative. Fortunately, a full 99% of the word-stems appearing in these sections were identifiable from the translated sections. But it isn’t enough to take a segment of untranslated text, and simply string together glosses (readings) pulled from the translated sections of the narrative. While we may not grasp all of the nuances conveyed by variations in the form of, for example, the verbal prefixes, we do have non-literal English glosses from Kenoyer’s translations to go with practically every recorded variation. For more frequently used forms, we have a range of such glosses. Moreover, with respect to the verbal prefixes in particular, those in Kalapuyan languages are characteristically multi-functional. A particular prefix or prefix complex typically combines reference to the subject of the verb action with its temporal and modal characteristics (tense and aspect, actuality or potentiality of realization, etc.). The decision of which gloss from the range of recorded glosses to apply to a particular form in a particular case requires close attention to the narrative context. 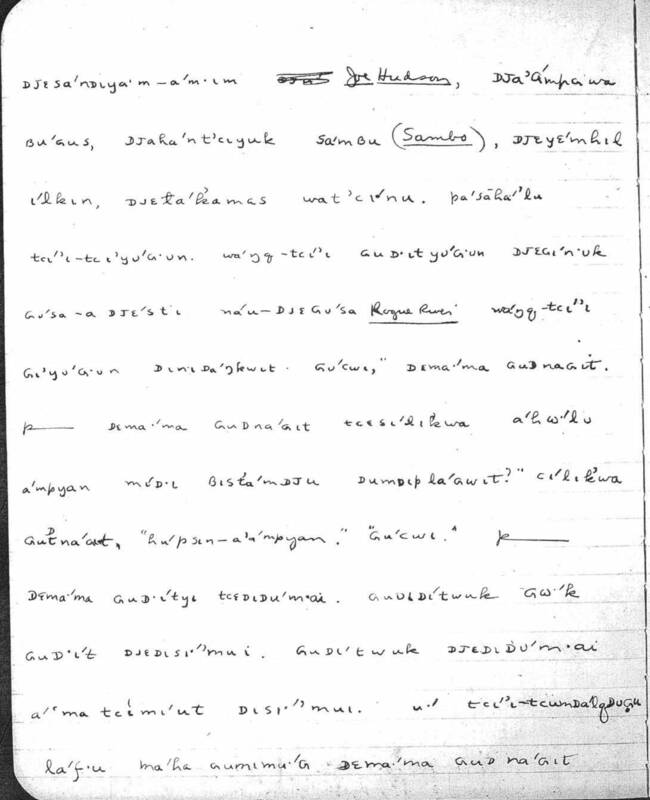 meanings in his Tualatin that it does in Chinuk Wawa: “paper, letter, document, book”; only Kenoyer uses it in some sections of the narrative with the extended meanings “reader” (that is, lesson book) and “grade level” (referring to which graded reader a student in the reservation boarding school is up to). The untranslated text segment describing daily lessons in the reservation boarding school would be very opaque indeed, had we not a preceding translated section in which “pipa” is used explicitly with reference to students’ grade levels. The relevance of Chinuk Wawa to Kenoyer’s narrative is apparent not only with respect to borrowings used to express key concepts, as in the above example. One of the things that struck me personally is how suggestive Kenoyer’s Tualatin word orders are of Chinuk Wawa word orders: grammatical subjects precede the verb; grammatical objects usually follow the verb, but can be fronted for focus; temporal adverbs and adverbial phrases usually come clause-first, or occasionally, appear in clause-final position; there is a single universal preposition. While subject-verb-object order is equally characteristic of English, the other features are less so. By contrast to his highly uniform and predictable word orders, Kenoyer’s verbal morphology reveals many indications of inconsistency and irregularity: prefixes are usually, but not invariably present, and come with many variant forms; productive suffixes are few, and appear only sporadically. We need more comparative work on Kalapuyan to tell how unique Kenoyer’s Kalapuyan is in these respects. My own experience was that upon immersing myself in his Tualatin narrative, I began finding it surprisingly readable, a development that I am inclined to attribute to its uniform (and, significant to my mind at least, Chinuk-Wawa congruent) word orders. By the time we got to the final stages of preparing the narrative for publication, I was able to sit down with the Tualatin text and proof it without reference to the translations. This has left me in the rather peculiar position of having achieved a real feeling for this language—only please don’t ask me to explain (in too much detail, anyway) exactly just what are all those prefixes doing!